There's no way around it. More home cooking (or at least increased preparation at home) is needed if you want to get off the fast-food bandwagon which is largely responsible for diabesity - the combination of diabetes and obesity that is affecting more and more people around the world. ​ Not everyone wants to eat breakfast and that's fine, but if you do; Why not start 'eating healthy' with your wake-up call and the first meal of the day... breakfast. This first recipe is 'low-carb', not 'no-carb' but you will read about how to reduce the carbs further if desired. Some people also add a few berries when in season or a very small quantity of dried fruit but it's important to watch the total carbs. One thing is clear. Whatever version you choose to make, it will be free of the emulsifiers, preservatives, colorings and other additives found in most commercial brands of granola. The basic idea is to mix your preferred low-carb selection of nuts and seeds before then, toasting them in a thin layer on a tray lined with baking paper at 140 degrees C in the oven for 30-40 minutes, stirring them twice after 15 and 25 minutes. Wait till you can see just the right warm golden colours before letting it cool down with the oven door open. Don't cook for too long or the more delicate coconut flakes will burn. ... This recipe is gluten free. Store in an airtight container for several weeks (if it lasts that long). There is no definitive recipe when you make this; vary it according to your taste and then, check your particular blend for carbs and fat. 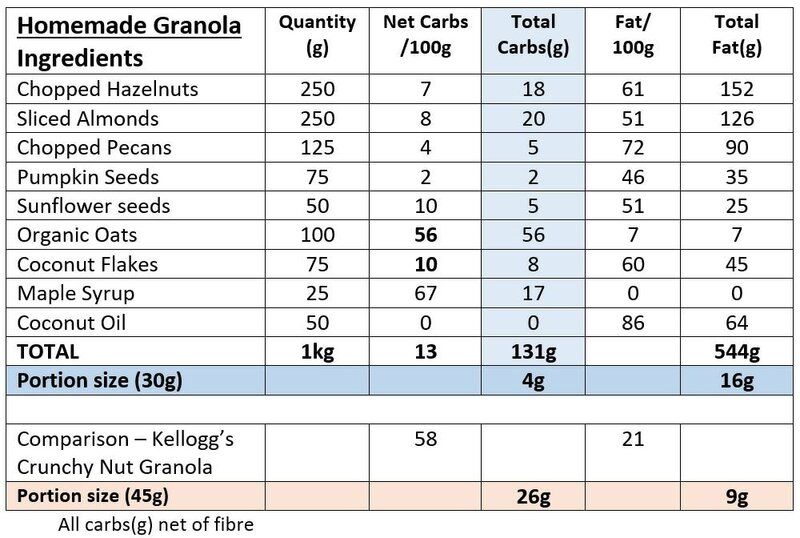 You can simply reduce the amount of quinoa flakes (or organic oats) if you want fewer carbs but I suggest keeping - or even increasing - the weight of coconut flakes for the taste if you drop the maple syrup. ​ The most important thing is to see how many fewer carbs you are eating compared to store-bought mueslis and granolas. Being more nutrient rich, a smaller 30g portion of your homemade granola is tasty, satisfying and filling, compared to the conventional approach when eating cereal - that being more to do with filling a bowl and then adding milk or yogurt. With this low-carb, high-fat alternative, you just sprinkle the crunchy granola on top of your chosen yogurt (see photo). A generous 30 gm portion gives you a maximum of 4 net grams of carbs and less if you lowere the proportion of maple syrup or oats/quinoa. "Personally, when I eat this for breakfast, I eat around 25g of Granola with 150g of my home-made Greek yogurt." Stay well away from all boxed supermarket cereals - they are full of refined carbs even if the descriptive words and photos appear to be "Oh so healthy". Whole grain rolled oats, whole grain wheat, sugar, rice, corn syrup, almonds, contains 2% or less of molasses, modified corn starch, palm oil, salt, cinnamon, nonfat milk, malt flavoring, polyglycerol esters of fatty acids, natural and artificial flavor, guar gum, BHT for freshness. Vitamins and Minerals: Niacinamide, zinc oxide, vitamin B6 (pyridoxine hydrochloride), vitamin C (sodium ascorbate and ascorbic acid), vitamin A palmitate, reduced iron, vitamin B2 (riboflavin), folic acid, vitamin B1 (thiamin hydrochloride), vitamin D, vitamin B12. ​Mix all the ingredients lightly together and divide into two parts. Spread ½ ingredients onto one oven tray covered with baking paper; roll it thin by placing an additional sheet of baking paper on top. Roast/toast at 180 degrees C for around 30-40 minutes, or until golden brown. When just out of the oven, sprinkle with salt. Cool, keep dry and eat with smoked salmon, cheese or what you fancy! As above with granola; there is no definitive recipe; You can reduce or remove the amount of quinoa flakes if you want fewer carbs but the almond flour is needed for a crisp base to the crackers. 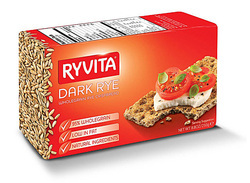 A Ryvita-sized portion gives you 2g or 1g net carbs. ​This shows the full carb load. For net carbs without fibre, you can halve these figures. Ingredients: Wholegrain Rye Flour (97%), Rye Flour, Salt. 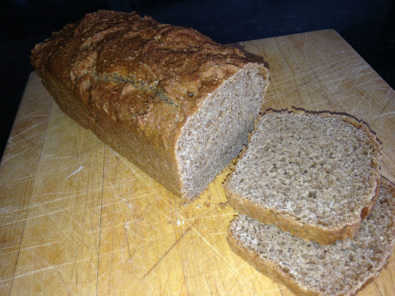 Rye (gluten). May contain Oats, Wheat (Gluten), Sesame Seeds and Soya. Want the scoop on why you should make your own cottage pies? The very best way to prepare and bake using Einkorn is by using Sally Fallon's methods (see book below), but here is a less time-consuming alternative. 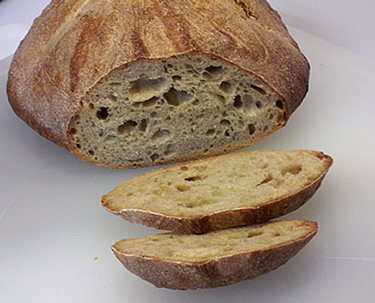 It tastes not unlike other wholemeal type breads but its digestibility is far, far superior. First... dissolve yeast in the lukewarm water. Wholemeal Flour, Water, Malt Flour, Yeast, Sugar, Wheat Protein, Salt, Malted Wheat Flake, Toasted Wheat Flake, Vinegar, Vegetable Fat, Soya Flour, Emulsifier E472(e), Flour Treatment Agent: E300.